Nine additional sensors provide uses with an in-depth thermal audit. 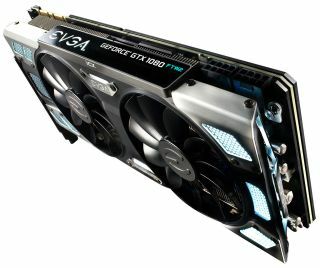 EVGA has a new high-end graphics card available, the GeForce GTX 1080 FTW2, one of several new GeForce 10-series cards to use the GPU maker's new interactive iCX technology, which features nine thermal sensors embedded on the printed circuit board (PCB). This is basically next-level cooling for graphics cards. To be clear, EVGA emphasizes that "iCX technology is not JUST a cooler," it's a mix of technologies designed to reduce temperatures and give users fine grain control. There are two fans on this card, one for the GPU (left fan) and one for power/memory (right fan). The added sensors provide temp readings of both, and based on those readings the accompanying fans can be individually sped up or slowed down. Cards with iCX cooling also feature fin holes to allow for direct airflow through the fins. The fins are half open to maximize airflow and L-shaped to increase surface contact. The baseplate and backplate are both die-cast and form fitted, also for the purpose of making direct contact with all vital components to maximize heat dissipation. Including the GeForce GTX 1080 FTW2, EVGA's iCX cooling scheme has been applied to 10 new graphics cards, including four GTX 1060 parts, three GTX 1070 cards, and three GTX 1080 models. A handful are available now and the rest are coming soon.